An efficient system for the joint acquisition and analysis of multi-component active and passive seismic data is presented. It is shown how, in spite of the limited field equipment (the system requires just a 4-channel seismograph, one 3-component and four vertical-component geophones), it is nevertheless possible to define up to seven different (but mutually related and complementary) objects used to constrain a multi-objective joint inversion capable of providing a robust subsurface shear-wave velocity (VS) profile for both geotechnical and seismic-hazard studies. The presented approach relies on acquisition techniques that require simple and straightforward field procedures useful in particular, but not solely, in the characterization of urban and remote areas where, due to logistical problems, standard acquisition procedures cannot be easily applied. Active data recorded by a single 3-component geophone are processed so to define up to five objective functions: the group-velocity spectra of the three components, the radial-to-vertical spectral ratio and the Rayleigh-wave particle motion frequency curve. Passive data are used to compute two further objects: the horizontal-to-vertical spectral ratio and the phase-velocity dispersion curve obtained via miniature array analysis of microtremors. These seven objects are jointly inverted by means of a multi-objective inversion procedure based on the Pareto criterion. Performances are assessed through a comprehensive field dataset acquired in an urban area of NW-Italy. The consistency of the overall procedure is assessed by comparing the results with the analyses accomplished by considering classical multi-channel active and passive data and methodologies (multi-component MASW, multichannel analysis of surface waves and ESAC, extended spatial auto-correlation). This work was partly supported by the Institute of Rock Structure and Mechanics (Czech Academy of Sciences—Prague, CZ) in the framework of the long-term conceptual development project RVO 67985891 (Institute grant for the “Extreme Seismics” project). 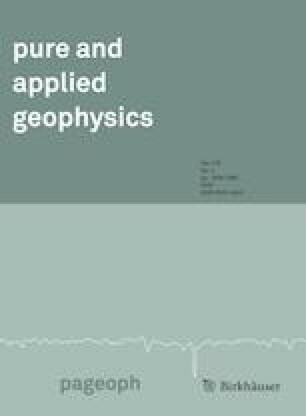 The author is also grateful to Prof. Herrmann for his help in clarifying the sign convention adopted by his Computer Programs in Seismology. The paper significantly benefitted from the comments and suggestions of two anonymous reviewers whose comments were highly appreciated. Abbate, E., Fanucci, F., Benvenuti, M., Bruni, P., Cipriani, N., Falorni, P., Fazzuoli, M., Morelli, D., Pandeli, E., Papini, M., Sagri, M., Reale, V., & Vannucchi, P. (2004). Carta Geologica d’Italia—F° 248—La Spezia. Regione Liguria. http://www.isprambiente.gov.it/Media/carg/note_illustrative/248_LaSpezia.pdf. Accessed June 2018 (extended English abstract). Herrmann, R.B. (2018). Computer programs in seismology. Open files. http://www.eas.slu.edu/eqc/eqccps.html. Accessed Aug 2018. Ikeda, T., Asten, M.W., & Matsuoka, T. (2013). Joint inversion of spatial autocorrelation curves with HVSR for site characterization in Newcastle, Australia: Extended abstracts of the 23rd ASEG conference and exhibition. http://www.publish.csiro.au/ex/pdf/ASEG2013ab315. Accessed Aug 2018. Scales, J.A., Smith, M.L., & Treitel, S. (2001). Introductory geophysical inverse theory (p. 193). Open file, Samizdat Press. http://www.e-booksdirectory.com/details.php?ebook=9154. Accessed 21 Nov 2018.